The Pyle Home connection kit is your one-stop-shop for all your home entertainment cable needs. Take the frustration out of set up with a kit that has it all, including an HDMI to DVI adapter, an S-video cable, a Toslink cable for optical digital audio, an HDMI cable, one stereo RCA audio cable, one component video cable, and one composite video cable. All cables are 6 ft. in length and are properly shielded for high-quality video connections. YOUR ALL IN ONE SOLUTION: The HDTV audio video cable connection hardware makes it easy to get everything you need in one convenient kit. HOME THEATER READY: Pyle Home connection kit has every wire you need to get your home theater setup started, including an HDMI to DVI adapter, an S-video cable, a Toslink cable for optical digital audio, an HDMI cable, one stereo RCA audio cable, one component video cable, and one composite video cable. JUST PLUG & PLAY: Simple to use, portable and handy. 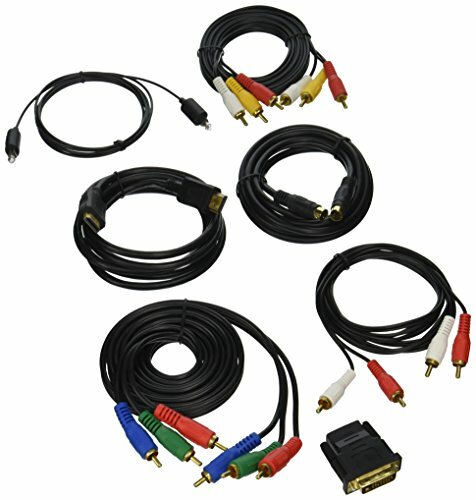 This HDTV A/V cable kit has everything you need to make create seamless connections and better signal transfers. GREAT FOR HD DEVICES: Get high-definition cable connectors for LCD and DLP TV sets and DVD players. SUPERIOR CONNECTORS: Gold plated connectors are the highest quality for stable signal transfer. Includes six feet of assorted cables.